Click here to view video in full screen. ​“I couldn’t believe I could make a living out of this”, Stephanie Perry says about her company, Sweeties-Southern&Vegan Catering.In Stephanie’s case this is not the trite expression you use when you are blessed by success. In her case, disbelief is almost an understatement. Read More. ​​ This year empowered us in the food world to pay extra close attention to the emboldened local women who make us proud. And, in 2017, women were not just celebrated as chefs, they also strengthened our communities through activism and conscious efforts to give back. Here are a few. Stephanie Terry officially launched her catering business this year, which she proudly calls anti-racist. Terry shares her vision of an equitable society through her own experiences as a community organizer and a formerly homeless single mother of five. Read More Note: You will need to scroll down through article to read Stephanie's piece. Stephanie and Michael Terry sit at the coop cafe in Chatham Marketplace... having a spat because I asked them about grits. "Oh, that's a big argument," Stephanie says, laughing. "But how do y'all fix your grits?" I ask. Michael narrows his eyes playfully on Stephanie and releases a quick sigh. "I let her fix them." "It's because mine are better!" 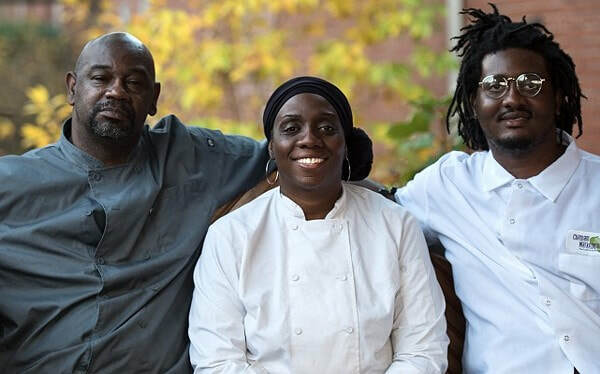 ... REI has been doing so many workshops in the Triangle, it has spawned it own catering company, a cottage industry to feed the fight against racism. ©2014-Present. Stephanie Perry, Sweeties Southern & Vegan Catering, L3C, Chapel Hill, NC.